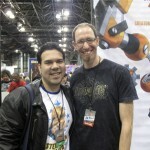 Thoughts on Cinema » Blog Archive » New York Comic Con: Look at the SIZE of you! 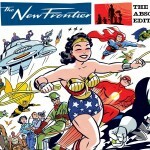 Comic book conventions in New York City are nothing new. When I first started going to conventions, there was about seven a year. But, in 2006 it was announced that there would be one big convention to rival that of San Diego in terms of scope and announcements. Thus, New York Comic Con was born. I remember having the chance to go to the first one, but money was a factor. It was lucky I didn’t go, because there were numerous reports on the news that the convention was so big the fire department almost had to shut it down due to the amount of people in the Jacob Javitz Center. Little did I know that four years later, when I finally did attend the convention, I would totally understand just how big and just how many people it would take to scare the fire department. As I’ve said, I’m no stranger to conventions. However, the scope of the place stunned me. Until that point, the biggest convention I had ever seen was the New York Sci-Fi Fantasy Convention held back in Madison Square Garden, and that paled in comparison to this. Walking to the Javitz Center was akin to walking down to the pier to see the fireworks on the fourth of July. There were lines of people, most in costumes, slowly taking two steps at a time as they moved forward towards the entrance. Walking in, the lines somehow increased as everyone waited in line to get their badges to enter. There was not a staircase empty nor five feet of open space available to walk when entering. Everyone wanted in. The biggest surprise when finally passing those velvet ropes was just how massive the floor was in scale! The map that was made available on the site didn’t do the place justice. The hall that housed Artist Alley and all the attending celebrities was just as large as the entirety of the Madison Square Garden convention…maybe even more! Table after table of artists, writers, podcasters, webcomic creators and celebrities was daunting because of the sheer number of them. The rows of tables were under the letters of the alphabet and yes, all 24 letters were used, that’s how many people were there! Going down the tunnel/cross way they had built to the exhibit area, I found the previous space almost a joke! The floor that housed the vendors, the booths of the big comic companies, the gaming booths and everything else you could want at a convention was like a labyrinth of interest. Even with the map, it was difficult navigating your way to all the places you had marked and wanted to see. This isn’t a bad thing as it lead you to tables you might not have known were there, like the Comic Drawer Boxes booth or the wonderfully vibrant cartoons of Alan Schell and even the small but totally satisfying Doctor Who Store booth. There was something for everyone, and I don’t mean that as a euphemism, either! Every day had its challenge in regards to the crowd. Friday was all about seeing everything you could first; the spectacle of it all and the fact that it was day one of a three day event meant everyone wanted to absorb as much of the convention as humanly possible. Saturday was all about crowds, as it was the weekend and more people had the day off as opposed to the day before, so trying to walk at least five feet through any given area was difficult but not impossible. Sunday was kids day, and while you had more room to maneuver, you had to watch where you were going as carrying heavy bags of swag and sharp turns could mean injuring a little one who is marveling at all the wonderful sights around them. And boy, were there sights to see! If you were adventurous enough to stand on line for a panel, you got such great surprises as the X-Men Arcade game finally coming to home systems through download marketplaces and perhaps watch the first five minutes of the upcoming DC Universe Animated film All-Star Superman? But, if there was one other complaint I heard about Comic Con, and believe me, there were few aside from how ridiculous the crowds were on Saturday, it would have been the artists, writers and creators being unhappy with the configuration of Artists Alley. 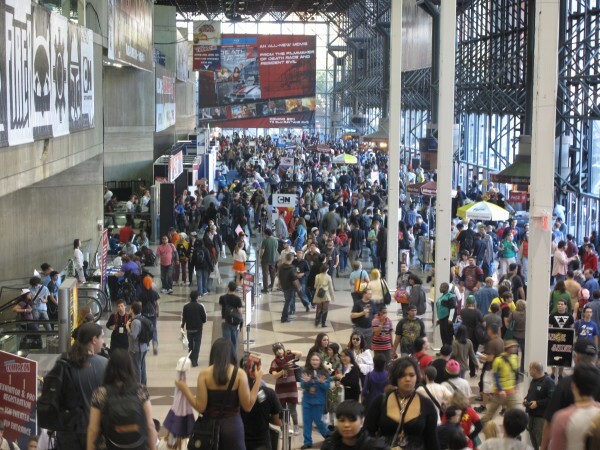 While most conventions have that particular part of the convention located within one area, Artists Alley is usually in a spot where fans have easy access. 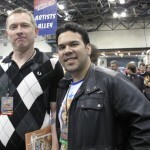 At NY Comic Con, Artist Alley was located all the way in the back of the convention. Add that to the fact a lot of names were constantly changing tables, it made looking for your favorite men and women all the harder to find in their obscure, cornered-off areas. That being said, no convention is perfect. But, for my first New York Comic Con, and my first “big time” convention, I have to say the sheer scope of it all amazed me. There was so much to see and so much to do, and so little time to do it. 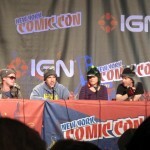 Hell, I was there all three days and I still feel I missed out on some great panels, booths, and creators. But, looking at the stuff I did get to see and do, it catered to everything the fan in me loves. There were so many things to buy and so many hands to shake, you couldn’t ask for anything more. Look at the SIZE of you!